Yesterday we were giving a presentation to The Dartmouth Institute's Health Professions Educators' Summer Symposium on various plagues that are nicely documented here in Rauner. It was a room filled with death and despair: one section was devoted to a small pox outbreak that hit Hanover in 1777, another to the cholera pandemic of the 1830s, and another on the bubonic plague that devastated London in 1665. The London plague (alluded to in an earlier post) brings to mind Monty Python, of course, but also fleas. 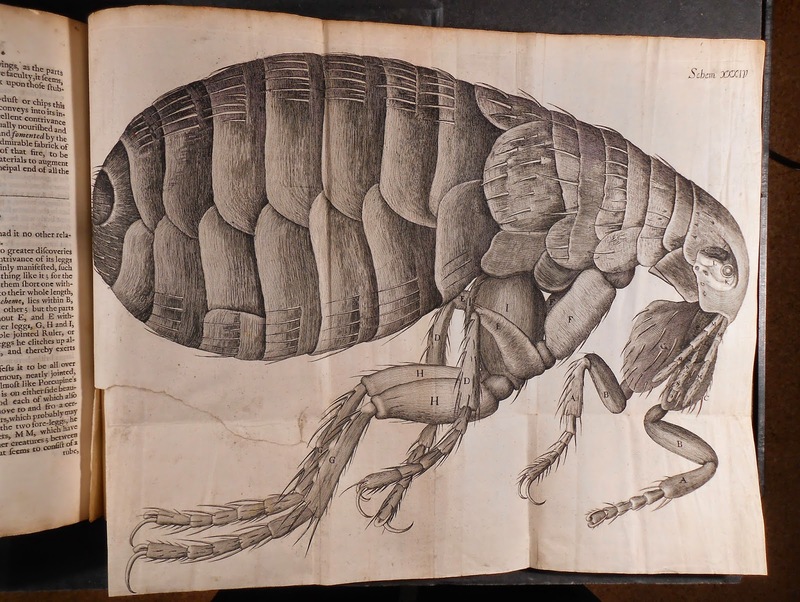 And fleas reminded us of one of our favorite books, Robert Hooke's Micrographia (London: J. Martyn and J. Allestry, 1665). Micrographia was the first detailed account of life under a microscope. Hooke's meticulous descriptions and illustrations revealed a wondrous new world to behold. But it was the irony of the publication date that was a wonder yesterday. The book came out in September of 1665, right when London was in the throes of the Plague. Little did the original readers know that the marvelously illustrated creature made so utterly foreign by the microscope was the source of all of their current sufferings. To see Micrographia, ask for Rare QH271.H79. 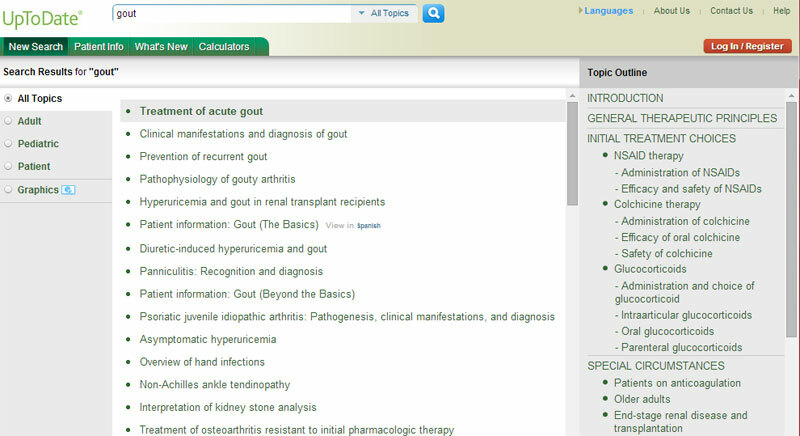 The Biomedical Libraries has a new resource that allows you to access full text clinical books, watch procedural videos and animations, and take self-assessment exams. Full text of 85+ clinical textbooks including Harrison’s Online, CMDT, Schwartz’s Principles of Surgery, Tintinalli’s Emergency Medicine, Pharmacotherapy: A Pathophysiologic Approach, and more! More than 250 examination and procedural videos, patient safety modules, audio files, and animations. Extensive self-assessment with thousands of Q&As to prepare for exams. Drug database to look up dosing, indications, and adverse reactions with thousands of generic and name-brand drugs. Differential diagnosis tool that allows you to browse 1,000+ diagnoses by symptom, disease or organ system. Concise evidence-based outlines of common medical conditions for the clinical setting. No VPNs or extra logins required! Simply create a MyAccess account while authenticated on the Dartmouth or DHMC secure network. Your registration expires if you do not log in every 90 days from either your device or computer on the Dartmouth or DHMC secure network. Access to the site on your mobile devices and from off-campus computers. Access to the Q&A feature and prior quiz result scores. Save and download image capability, including the ability to download images directly to PowerPoint. From the Biomedical Libraries web page, click on the “Access Medicine” link under resources, while authenticated on the Dartmouth or DHMC secure network. Click on “Dartmouth College” at the top right of the screen. In the fall of 2012, each incoming student at the Geisel School of Medicine at Dartmouth received an iPad as well as a variety of productivity and content apps to aid learning. As part of the iPad initiative, faculty willing to investigate the educational value of the iPad also received a device. A number of faculty, after attending iBook Author workshops facilitated by Apple educators, decided to create iBooks. The following are excerpts submitted by faculty describing the rational for creating iBooks, the experience of creating iBooks, and student reaction to the iBooks. For more information, please contact Geisel.Instructional.Technology@dartmouth.edu. SBM Cardiology (Yr2) – James Bell, M.D. I give approximately 20 hours of lecture in the 2nd year Fall SBM Cardiology curriculum. These lectures are supplemented by a series of fairly extensive lecture notes and PowerPoint slides. In the past, some students have been confused as to where they should spend their study time: the notes, the slides, or reviewing the lecture on video. In an attempt to resolve student confusion, I constructed a series of iBooks for each of my lectures to integrate the key aspects of both the lecture notes and the most important illustrations from the PowerPoint slides. I'm a bit of a visual learner, so I put a lot of emphasis on the juxtaposition of text and graphics on each page. I particularly appreciated the ability to use video (e.g., echocardiogram) and sound recordings (especially helpful in describing heart sounds and murmurs). I tried to make each page a separate entity, to minimize page turning when trying to make a point. 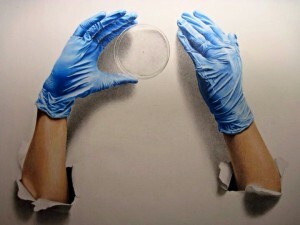 I was on a pretty steep learning curve, but I really enjoyed learning to create what for me was a work of science and art. There were, of course, some problems. I think the biggest was that none of the other (SBM Cardiology) lectures had iBook counterparts, leaving students with the previous dilemma of how to distribute their study time. Another was that, despite my hope that students could just use the iBook and not worry about the notes and slides, many of them saw the iBooks as just one more study object to occupy their time. Medical Virology (Yr1) – Edward Usherwood, Ph.D.
For the 2012 – 2013 academic year, I created two iBooks for the Medical Virology course for Year 1 medical students. The books synthesized lecture notes and slides from the lecture, so they are together in one integrated document. The ability to insert sets of sides as galleries in the iBook allowed students to review all the visual material together with the pertinent section of the text. It also removed the inconvenience of switching between Word and Powerpoint files when reviewing notes and slides, respectively. There was something of a learning curve when I began to create the iBooks, but the online tutorials on Lynda.dartmouth.edu were an invaluable resource when learning the interface. Student feedback was overwhelmingly positive, the most common comment being they liked the format as a single, integrated document containing all the relevant material in one place. In response to this, for the 2013-2014 classes, we are converting all lecture notes in this class to the iBook format. Currently, I am exploring inserting more video and internet-based content into the iBooks to enrich the experience for the students. The recent release of Apple’s OS X Mavericks will make iBooks even more accessible since they will run on a Mac laptop as well as an iPad. Medical Physiology (Yr1)– Andy Daubenspeck Ph.D., Eugene Nattie M.D., Donald Bartlett M.D. The fall 2013 semester was the first year that the Medical Physiology 110 faculty were able to effectively prepare lecture notes (13 iBooks) and concept-specific materials (7 iBooks). Lecturers were responsible for producing the lecture note iBook for their assigned topics. The responsibility for developing the concept iBooks that covered more basic material pertinent to multiple lectures was assumed by Andy Daubenspeck. An essential aspect of the development of these lecture note iBooks was the summer assistance of Jason Laurita, a rising 2nd year medical student, who was able to massage the material from various lecturers into quite impressive iBooks. Hermes Yeh, chairman of Physiology and Neurobiology, was very supportive of this and found the funds for Jason’s efforts. Based upon discussion with the Year 1 curriculum representatives, who gave us thoughtful insights about the effectiveness of the iBooks, we realize that preparing these materials is a process of continuing improvement. We may have unconsciously made the content of some iBooks unnecessarily difficult for first year students to follow and grasp. In addition, we may have underutilized linkages to available web-based resources that students found useful. We also have not fully responded to the difficulties facing incoming students for whom English is not their first language. As a result, we anticipate substantial revisions to the iBooks for next fall to simplify the verbiage, to incorporate improved guidance as to the overall goals for each iBook and of each iBook within the overall course, and to incorporate more of the useful, web-based resources (e.g., Khan Academy offerings). Human Anatomy and Embryology (Yr1) – Virginia Lyons, Ph.D. Creating an iBook is not difficult, and you do not have to start from scratch as your existing notes and PowerPoint slides can easily be imported. The training videos on Lynda.dartmouth.edu provide everything you need to get started with iBooks Author. If you plan to incorporate iBooks into your course be forewarned: once you provide some of your content in iBook format, the students will want all of your content in this format. Creating iBooks takes time and we were fortunate to have the assistance of Aaron Steen, a medical student who had recently completed our course. However, once you create your books, it would be naïve to assume that you are done; iBooks offer so much potential for creativity in content delivery, you will find yourself spending your evenings tweaking your iBooks…but you won’t mind because it is fun! Natural Standard, a database assessing herbal medicine, supplements, and other complementary and alternative therapies, is now available from the Biomedical Libraries. Connect to http://www.naturalstandard.com. Natural Standard describes itself as founded by healthcare providers and researchers to provide high-quality, evidence-based information about complementary and alternative medicine including dietary supplements and integrative therapies. Grades reflect the level of available scientific data for or against the use of each therapy for a specific medical condition. It is impartial; not supported by any interest group, professional organization or product manufacturer. The evidence grading system is explained at http://www.naturalstandard.com/grading.asp. Other sources of information about alternative therapies include free sites such as Medline Plus, HerbMed.org, the National Center for Complementary and Alternative Medicine, and the Office of Dietary Supplements, as well as comprehensive drug information resources from the Biomedical Libraries such as UpToDate, Clinical Pharmacology Online, DynaMed, and Micromedex. Questions? Contact Peggy Sleeth, Associate Director for Information Resources.